Anyone wanna ride on Sunday? I'll be out of town all day Saturday, but would like to ride on Sunday if y'all are up for it. 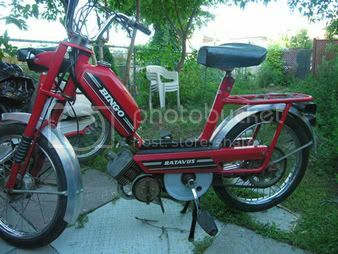 Thanks to Brent my little Batavus Bingo is back on the road and I'l like to bring her out (even though it has NO suspension and I have a wickedly bruised tailbone from derby practice on Wednesday). You know I'm in,BUT, dare I say it...CHUNKY FRIES!!!!! ;O}Darcy. I am in for Sunday!. Havent been able to make it out the last few weeks so I cant wait. Lindsay, nice moped! Sweet looking machine. I got north almost every weekend so unless there is a week night ride I'm not able to hook up. Have a fun ride this Sunday is supposed to be great weather for a ride. what time do y'all wanna do it on sunday? shall we do the usual 3pm at squirly's? Sunday at 3, it is then. You can't go wrong predicting Thunderstorms in the summer. Ill see what the weather is like around 1:00 before I head out. Hopefully it does hold off. cool......just gimme a shout and let me know if you're coming. ya can park the van on my street so just let me know and i'll wait for you before i leave. Ouch. Looks like rain here. Thunder showers just hit in north-york, I'm out. yeah it just started raining here too. ok, me and dave are out. arrrgh! I'll just go make my own damn chunky fries and play god in Sim City 4. (where it never rains) So have as much fun as you can folks. Darcy. PS. How'd the game go last night Lindsay? Ok that was fun. I got about 30 minutes down the 401 and there is an accident that had traffic stopped. I quick got off at 6 South and thought Id come in the QEW instead. Then the skies open up and it is pouring rain with no sign of letting up, and it was heading east. So I decide to bail and head back home. Maybe next weekend. hello!!!! havet seen you all for couple of months now. my sister in town and i have to take care of her. busybusy.